Unlike its hard outer surface, the soft pulp inside the tooth is rich in blood vessels and nerves. Problems in this area are often signaled by tooth sensitivity and pain. When we find these symptoms during an examination, we generally use radiographs (x-rays) to confirm that the pulp is diseased, or dying. That's when we need to take action, before an abscess or further infection can develop. Pulpectomy. 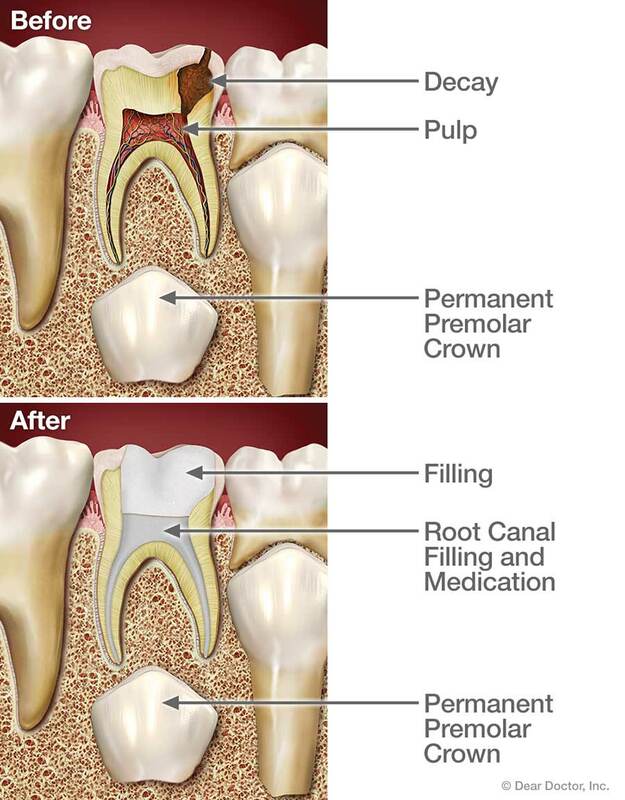 If pulp tissue is infected through the entire tooth structure, a pulpectomy may be needed. Here, we remove all pulp tissue, disinfect and shape the canals, then fill and seal them with inert material. Afterwards, the crown (visible part) of the tooth will be restored. This resembles traditional root canal therapy, with a crucial difference: The sealant we use in children is capable of being dissolved by the body. That way, when it's time for a permanent tooth to erupt, the baby tooth's roots can be naturally absorbed and tooth development can proceed normally. As you probably already know, most of the legends you may have heard about root canal therapy simply aren't true. In fact, the procedure generally causes little discomfort, but is quite successful in relieving tooth pain! We are adept at using anesthesia to block the sensation of pain, and experienced in calming the fears of young ones. While it's understandable that you may be nervous, it will help if you don't let your child pick up on your own anxiety. A calming voice and a gentle touch can do much to relieve stress. After a thorough examination, we will recommend the best options for your child's treatment. The procedures are routinely done right here in our office. Afterwards, we will give you complete follow-up instructions, and schedule a return visit. A root canal is nothing to fear: Think of it as a treatment that may save your child from some tooth pain now, and potentially a lot of corrective dental work later on.